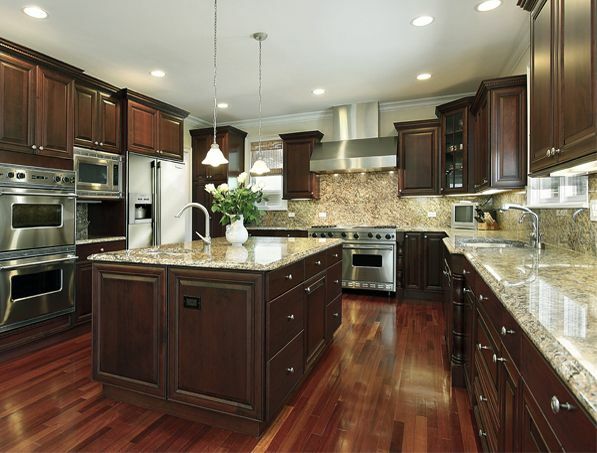 Any dark color cabinets will gently touch to Giallo Ornamental Dark Cabinets Backsplash ideas. Your backsplash pallet is very wide to pick from pastel to earth tone mélange colors in kitchen remodeling. This article will guide you about the name and the characteristics of the backsplash and the color and glaze of the dark cabinets as well with my best picks. I would like to emphasize that Giallo Ornamental Light and Giallo Ornamental granite countertop can both used in your project. If you would like to dig some extra information, please look at my Warmth Welcoming: Giallo Ornamental Granite Countertop article. The other mentioning part is the harmony between Giallo Ornamental Granite and light plain color Ceasarstone. It is called mixed match countertop style in kitchen remodeling . Buttermilk color is a good example in this article. The material of the backsplash for Giallo Ornamental Dark Cabinets Backsplash Ideas can be herself, ceramic, travertine, tumbled travertine,stainless steel, tumbled marble and glass. The type of the backsplash tile would be subway, arabesque, dotted octagon, matchstick, 4×4 Square and mosaic. The liners and connections are a very good embellishment in any kind of selection of backsplash as like as Giallo Ornamental White Cabinets Backsplash Ideas. These beautiful Giallo Ornamental Dark Cabinets Backsplash Ideas Pictures are for your eyes. Picture Credit:Providence Homes , LLC., Giallo ornamental granite with rustic alder cabinets and rustic maple flooring. Backsplash is a nice combination of 6 x 24 vein cut travertine with 4 x 4 tumbled marble .Very rich taste in traditional rustic design. Picture Credit: Granite Division Inc., Capuccino Cabinets with Giallo Ornamental Granite composed with beveled ceramic Arabesque tile , Reflect your personality on the granite. Picture Credit:MK Design Group Inc.,picture taken by Craig Duce Photography via Houzz. Giallo Ornamental Light Granite with dotted octagon mosaic tiles, espresso cabinets and oak flooring in contemporary design. Stainless steel appliance and chandelier are bonus. Overhang island gives a space to eat and entertain in this kitchen. Spectacular design. Very catchy for Giallo Ornamental Light Granite Dark Cabinets Backsplash Ideas. Picture Credit: Lowes of Indian Land, SC., Giallo Ornamental Light Granite with Shenondoah Mc Kinley Cherry Chocolate Glaze Cabinets and polished travertine diagonal backsplash.Ornate pattern tile is Majestic from American Olean , Elegance Line. Very good example of carrying different style of tiles with Giallo Ornamental Granite . Picture Credit: Kitchen Craft Cabinetry Edmonton, Giallo Ornamental Granite with Semi Opaque Weathered Stained maple cabinets and mocha stained maple kitchen island. Kitchen island top is overhang and cut in arch shape . The glass backsplash is light beige neostile style. Engineered Bronze Maple from Aztec Collection flooring by Dansk. The diagonal layout of flooring gives a deep and roomy feeling. Very keen eyes design for detail lovers. Picture Credit:Ann Love Interiors Inc, picture taken by Merleprosofsky Photography., Giallo Ornamental Light Countertop with Mocha Cabinets and Stainless Steel supplied by Ames Tiles. The flooring is tumble travertine, stainless steel appliances and pendants are bonus. The best part of island is being overhang and inserted raised bar in the middle of the kitchen island.Award winning design in Home and Garden Tour. Picture Credit:Kitchens Etc, of Ventura County, Giallo Ornamental Granite Island Top and Caesarstone buttermilk countertop with ebony glazed cabinets. The backsplash is Eclipse glass. Stainless steel appliance are pendants are the additional beauties in this traditional style. Lovely picture that shows Giallo Ornamental Dark Cabinets Backsplash Ideas very typically. If you have any question about Giallo Ornamental Dark Cabinets Backsplash Ideas, please do not hesitate to drop a comment. Thank you for your collaboration.